JoJo Maman Bébé is the UK’s leading mother and baby brand offering competitively priced, fashionable maternity wear, adorable but practical baby and children’s clothing and a wide range of nursery products, gifts and toys for the 0-6’s. JoJo is the perfect place to shop for parents, grandparents and mums-to-be. Baby and Children’s clothes are quirky with a Breton influence. Extra soft sleepsuits, rompers and knits make perfect first clothes for newborns. For boys and girls there are everyday basics with excellent quality t-shirts, trousers, dresses and skirts. During colder months the polarfleece collection with hats, scarves, ponchos and jackets in bright, bold unique designs made from recycled materials is a bestseller and the summer season is catered for with the renowned swimwear and sun protection styles. 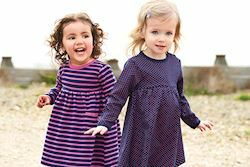 Older boys and girls can continue to wear their favourite JoJo clothes with the introduction of a 5-6 years range in the bestselling styles. When celebrating a new arrival or buying Christening gifts, JoJo has everything from muslins & bibs to cuddly friends, to mix and match to create the perfect present. The finishing touches are also available with beautiful gift boxes and cards. JoJo are experts in designing stylish and comfortable clothes for pregnancy. The aspirational maternity and nursing collection is designed in-house with styles for every occasion whether looking for basic tops and jeans, clothes for the office or elegant occasion wear. 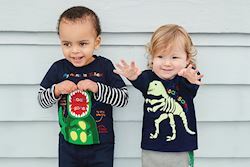 The exclusive designs are only available on the JoJo website or in JoJo stores ensuring that when buying from JoJo, pregnant women, babies and children really stand out from the crowd. JoJo are delighted to offer members an exclusive 15% off any order over £50. Shop online and obtain your discount by using code GP61 at the website checkout. The offer is not valid with multibuys, sale items or gift vouchers and cannot be used in conjunction with any other offer. Free delivery is only valid on orders over £35. Please see website for more details.